InVision. Find out why so many hot startups are using InVision to prototype, present & collaborate on design in real-time. Sign-up for a 90-day free trial today at: http://invisionapp.com/twist. If you’ve ever experienced frustration in the face of the U.S. higher education system and mounting student debt, you’re not alone. 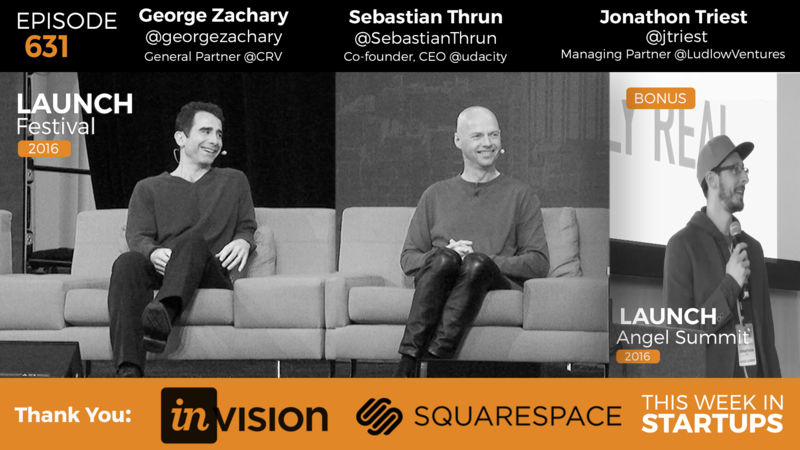 In episode 631 of This Week in Startups, filmed at LAUNCH Festival 2016, Jason guides a fireside chat with Sebastian Thrun, CEO and co-founder of Udacity, and George Zachary, general partner at CRV and heavy investor in Udacity. They discuss the broken system for higher education, MOOCs, and how Udacity continues to help workers adjust and succeed in a rapidly shifting job market. Then, at the LAUNCH Angel Summit, Jonathon Triest from Ludlow Ventures provides inspiration and examples on how authenticity is crucial to success. Sebastian gives some context to how Udacity and fellow MOOC (Massive Open Online Course) companies have succeeded and struggled in the past five years. In particular he discusses how he didn’t exactly know what he was doing when he launched Udacity, and was continuing to explore pivoting options up until as recently as 18 months ago. As the job and education markets have evolved, he and the team at Udacity have worked to continue providing value. George explains how early on in his investment with Udacity, his role didn’t focus on providing business guidance — he admits too that he had little experience in the industry and the level of disruption Udacity was creating. What he does underscore is how he put his confidence in Sebastian and helped provide him the moral support and suggestions to improve the company, and that this investment was as important as any he made in the company. Sebastian talks about how Udacity is helping fill a gap in the current education system, which contributes to their success. Most past jobs were in a single ‘vertical’ — you were a doctor, lawyer, or accountant for life –, but most job seekers now move horizontally just as frequently as they choose a specific vertical. The education system has been slow to respond to this trend, allowing MOOCs to gain huge traction. Despite their consistent alliance to help make Udacity successful, George and Sebastian take opposite perspectives on the future of education and work. George offers a “realistic” look at the factors currently putting stress on the U.S. employment market, whereas Sebastian expresses intense optimism that changes like AI and automation will help make the coming century the most exciting time to be alive. Jonathon gives several examples of how authentic, creative interaction has helped him secure deals with companies he might never have otherwise achieved. He speaks about how in a world that is severely lacking in authentic interactions, coming into the room and being “real” helps forge real connections that help you get farther in your ventures, and with more realistic support. Want to hear the whole conversation? The full episode with Sebastian Thurn, George Zachary, and Jonathon Triest, as well as past episodes are all available on This Week in Startups. 1:00–4:35: Jason asks George and Sebastian about the origins of Udacity and what drew them to start and invest in it. 4:35–9:11: Sebastian gives some insight into the rise of MOOCs and how Udacity has weathered the various storms surrounding the industry. George then gives insight into his own advisement/support as a VC. 9:11–12:08: Jason asks Sebastian about nano-degrees at Udacity and how learning is changing into a lifelong process. 12:08–13:47: Sebastian gives some insight into the student trajectory, Udacity partners that validate the nano-degrees, and creating horizontal pathways in a career market that favors verticals. 15:37–17:30: George discusses nano-degrees from a university/college perspective, and how Udacity is disrupting the ivory towers of higher education. 17:30–19:30: Jason asks about the structure and price of nano-degrees, and Sebastian gives data about Stanford as a comparison. 19:30–20:56: George talks about the appeal of nano-degrees, even as a compliment to traditional college degrees. 24:15–27:13: Jason asks Sebastian about how Google disrupting the job market, and how this actually creates opportunities to be happier in the long term. 27:13–30:56: Jason asks George the same question, and George shares what he believes the implications will be. 30:56–34:28: Sebastian shares his optimism for the future based on the timeline of innovation and creativity in the last few centuries. 38:41–40:12: Jonathon shares the philosophy of Ludlow Ventures and why this was the direction they took. 40:12–47:48: Jonathon shares stories about how authenticity and creativity help you stand out making small and big wins.